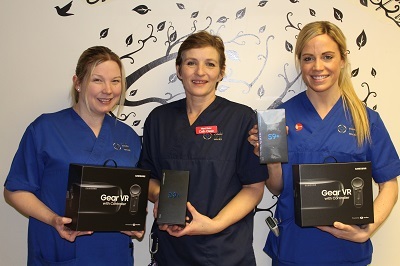 The Cardiac Team at the University Hospital of Wales have recently received a donation of VR headsets and Samsung smartphones to keep their patients entertained while on their wards. Cardiff & Vale Health Charity were lucky enough to win one of the wishes for a VR experience. Sarah Finch and Bethan Shiers, both nurses on the cardiac wards at the University Hospital of Wales took delivery of the items and were thrilled with the donation from Samsung. Sarah said: “We’ve been raising money on the unit to make the patient’s experience better as our patients can be with us for long periods of time. “We were lucky enough to care for a young man named Said “Hussain” Amiri who was born with a complex heart condition and underwent countless heart procedures and operations throughout his life. Health Charity Logo“Hussain was passionate about improving healthcare and standards across the NHS to all patients, not just cardiac patients. “Hussain sadly died, and he is greatly missed within the Congenital Heart Disease team and wider community, so we’ve carried on fundraising to make a difference on the wards in his memory. “He was especially keen to improve the care and facilities offered to young patients when admitted to hospital. He’d love that we’ve been able to get this equipment for use on the wards.